June 22, 1944 Italy Dear Dad & Mom: Boy was today a hey day, bot eleven letters two packets of stationary from you mailed the eighteenth and twenty second of May and the soap from Ivy, thank her of course but for gosh sakes don't let her send anymore. I can buy it cheaper here than you can get it at home........six cents a bar for Lifebuoy, Palmolive, etc. Ive got......supply on hand and as yet the P.X. has always......Was mighty tickled to get the stationary tho and....will last me a long time. Know it aint proper but I'd much rather write with pencil as so often you have your writing propped up on your knees or a rickety box, bucket or most anything and a pen will scratch & make a lot of chicken tracks you don't intend to. When I write V-mail they have to be in ink so they will photograph properly. 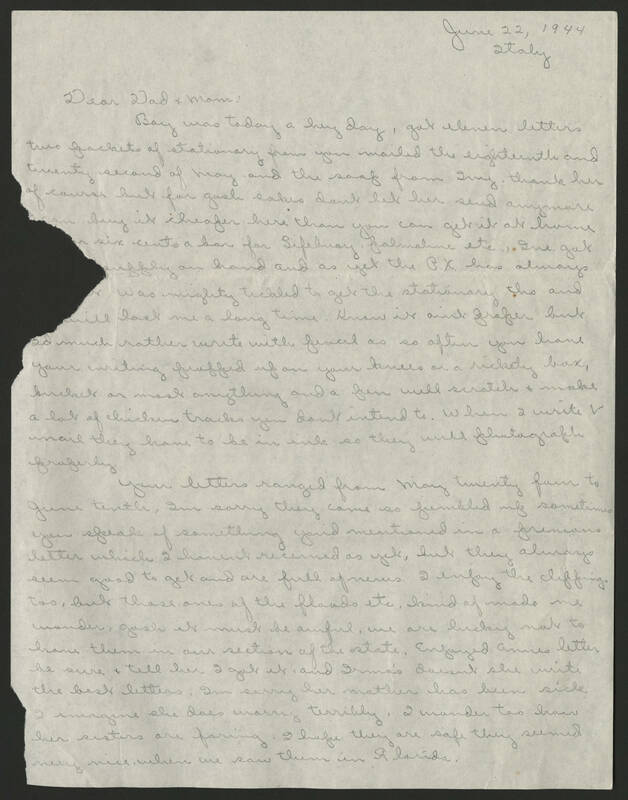 Your letters ranged from May twenty four to June tenth, Im sorry they came so jumbled up sometimes you speak of something you'd mentioned in a previous letter which I haven't received as yet, but they always seem good to get and are full of news. I enjoy the clippings too, but those ones of the floods etc, kind of made me wonder, gosh it must be awful, we are lucky not to have them in our section of the state. Enjoyed Annes letter be sure & tell her I got it, and Irma's doesn't she write the best letters. Im sorry her mother has been sick I imagine she does worry terribly. I wonder too how her sisters are faring. I hope they are safe they seemed very nice, when we saw them in Florida.